This past weekend I had the good fortune to take a fabulous 16 hour painting class. It was run by award winning painter Meg Maples of Arcane Paintworks. Taking the class was my Christmas present from Hubs. I am so glad I was able to do it, I learned *so* much. Best gift ever. There were about a dozen of us in the class, and it was held at Huzzah Hobbies, a game store I am very fond of. The store's only downfall is the distance from me, if it was a little closer I would game there all the time. 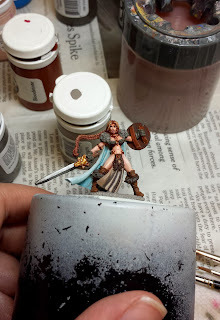 The miniature we painted was Reaper's Viking Girl. A fun model with some nice textures to work on. 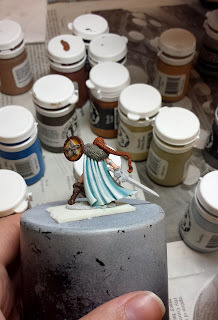 Normally I'm all over Reaper's miniatures, but most had serious trouble straightening out her sword. I was lucky and just needed to tweak it back a little on mine. I don't miss working with metal minis. We started by learning two brush blending on her cloak. This technique has changed my life. Essentially, you start by putting down a medium base color. Then you take two brushes, one loaded with a darker paint and the other damp with water. You apply a dot of paint in, say, the crevice of her cloak, and then use the wet brush to blend the dark color into the medium one. Same can be done with a highlight. The effect itself is great, but how easy it is to do is really what sold me on it. I am so proud of my cloak. Then she taught us how to do eyes. With a #2 brush. I wouldn't have believed it if I hadn't seen it with my own astonished eyes. My attempts were feeble, this was definitely where I struggled the most. I tried her eyes so many times that I started losing the detail in her face. I really ought to go back and remove that paint and try again. Meg suggested buying one of Reaper's Faceless Horrors to practice the eyes on, since it's 70% eyeballs. Done and done, he's on the way. Day two covered hair/fur and metallics. Much less frustrating than eyes, for sure. I don't think I really got the hang of the hair technique. I think with more practice (and a different color set) it will look a lot better. But the reddish brown just wasn't working out. As finished as I got her over the weekend. I would have liked to show you the 100% finished model, but unfortunately, holiday plans and travel got in the way. Silly family time, getting in the way of hobby time. I want to finish the fur and the shield (and try her face again) before I call her finished. One of things I didn't expect to learn was how much I like the P3 paints. 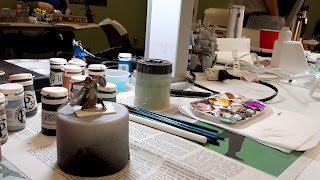 I've almost exclusively used GW paints (and a few Reaper here and there) since that's what we have had. 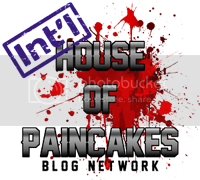 I don't think I am going to make the swap over, as we have so much paint already, but I'll probably use them again in the future. I wanted to get this post up a little sooner, but again, holiday travels. I hope you all had a wonderful holiday season. I'll be updating again next week with my 2013 Daemonette Project miniature. She is in progress! Congrats on taking the class! Sounds like fun! And that looks great, cant wait to see it when it is done! The one thing that makes P3 so wonderful to work with is they are using liquid pigment. I miss GW's inks and the old metallics. I am not at all fond of the new metallics. I'm still figuring out how best to use their new glazes, too. If you miss the old GW metallics, then take a look at the Army Painter Warpaints metallics. They are pretty much the same, I could swear their Gun Metal is the old Boltgun Metal. I do like the AP metallics better than P3s honestly.